from or inspired by Mexico. will be on Friday, November 3, 2017, from 6 to 10 pm. 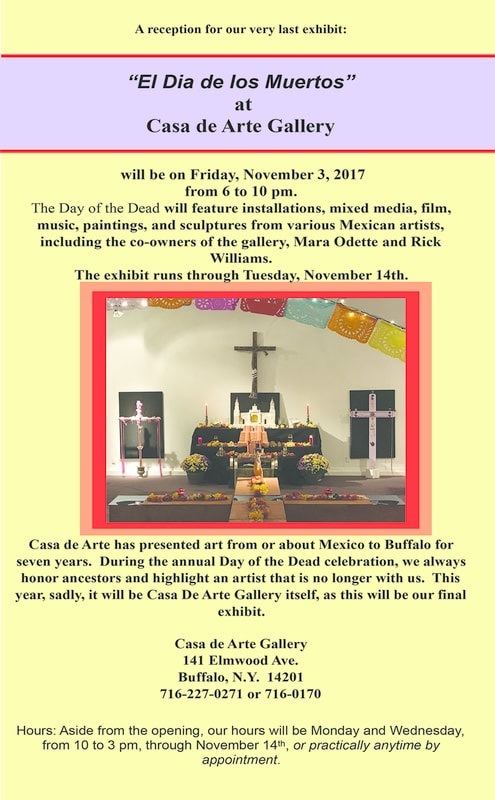 The Day of the Dead will feature installations, mixed media, film, music, paintings, and sculptures from various artists, including the co-owners of the gallery, Mara Odette and Rick Williams, and a host of artists from Mexico. The exhibit runs through Tuesday, November 14th. El Dia de los Muertos is a national holiday in Mexico. It features a blend of Mexican indigenous traditions with European Catholic influences, but it is first and foremost about honoring ancestors. Casa de Arte has presented Mexican art to Buffalo for seven years. During our annual Day of the Dead celebration, we always highlight an artist that is no longer with us. ​This year, sadly, it will be Casa De Arte itself, as we will close our doors for good after this, our final exhibit. Casa de Arte is the only gallery in Western New York (WNY) that consistently exhibits art from or inspired by Mexico. We are committed to presenting innovative artists and stimulating themes with solo and two artist exhibitions. The Allentown gallery opened in August 2011 with a mission of presenting a more accurate picture of Mexico through art exhibitions, cultural events, lectures and workshops. Consistent with our mission of cross cultural exchange, we also present many artists from WNY and Mexico. The gallery is in part commercial but it routinely presents exhibits that are noncommercial in nature. Rick Williams, who grew up in South Buffalo, and Mara Odette Guerrero-Williams, who is from Chiapas (southernmost state in Mexico) and grew up in Mexico City, are both artists and co-owners of the gallery.